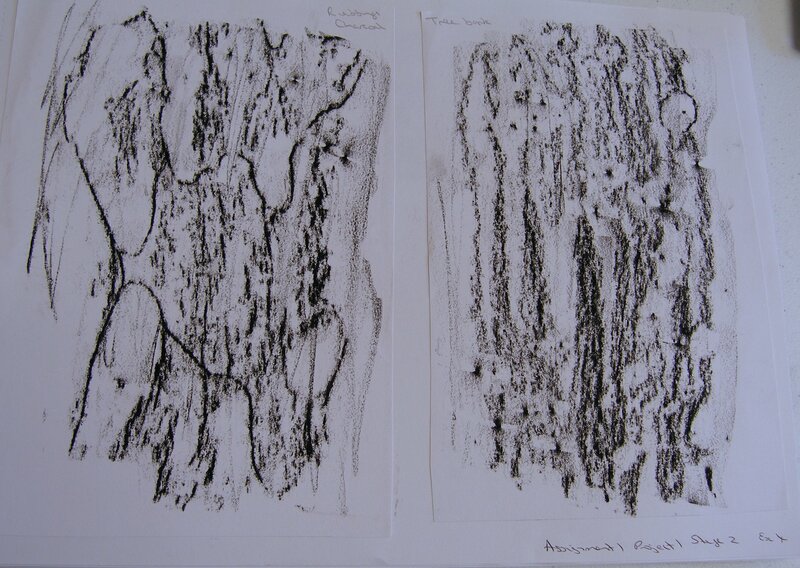 So far the mark making has been done in a conventional way, applying pencil or paint to paper. 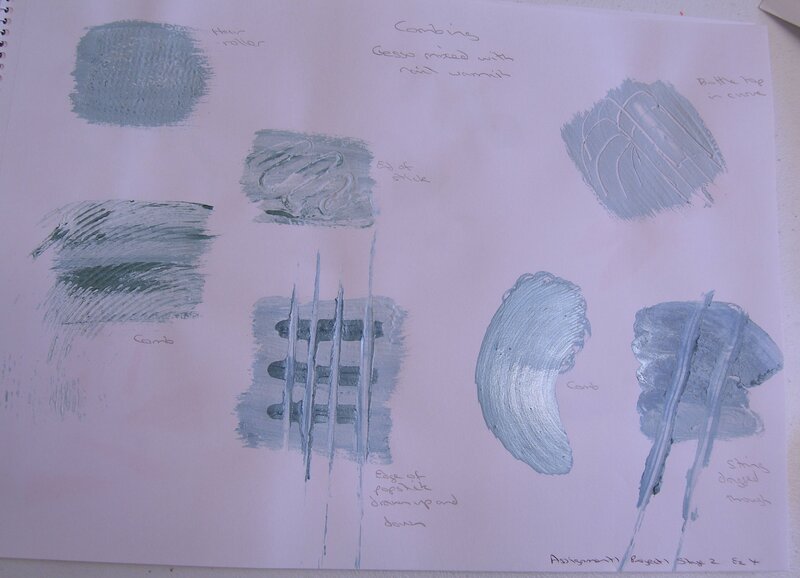 Now for the more experimental section using a wider range of methods. 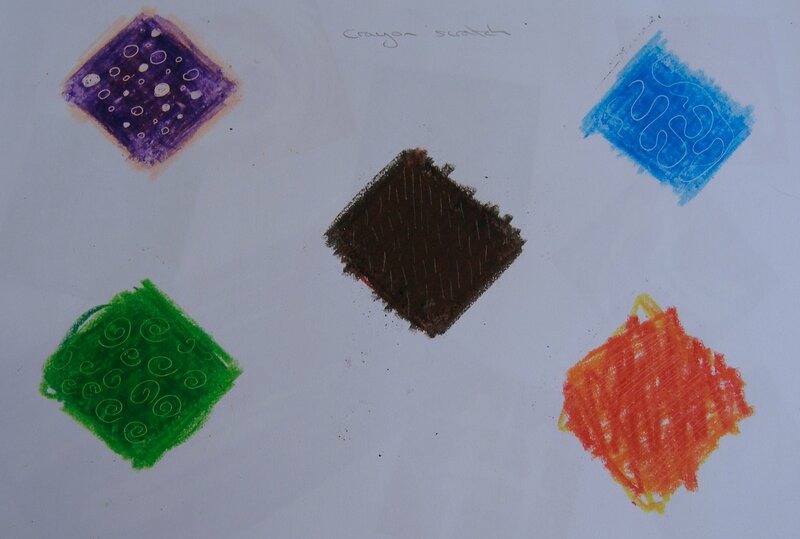 Different colours of wax crayons applied to the paper then covered with a wash of black ink. 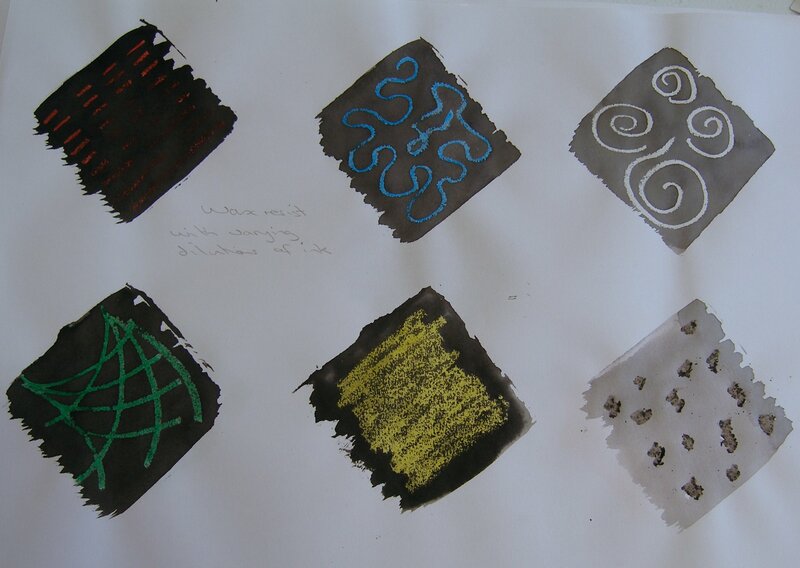 I diluted the ink in stages to produces a range of shades. A couple of thick layers of wax crayon were rubbed on the paper, then I used the end of a bamboo skewer to scratch away the surface layer to reveal the colour underneath. 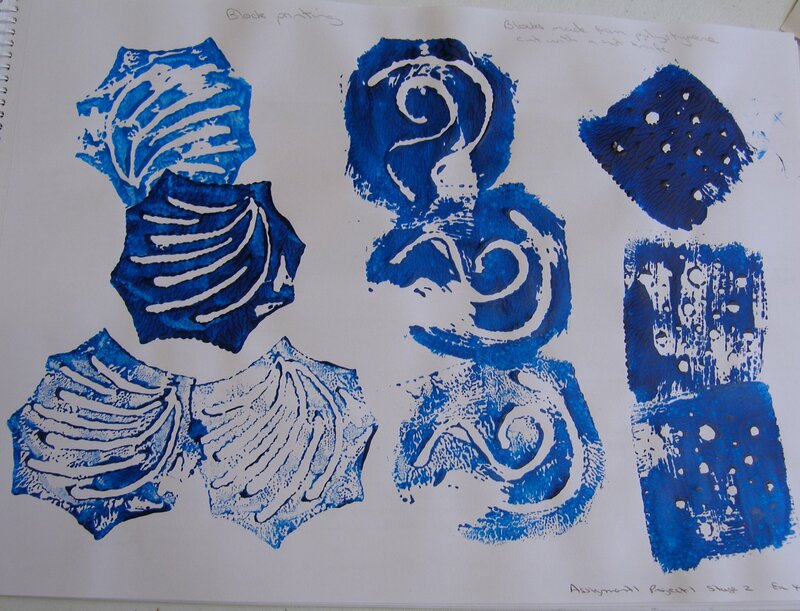 Bleach on two colours of tissue paper and also on blue crepe paper. The bleach was either dropped, applied with a paint brush or with the wrong end of a paint brush to produce a variety of lines. I particularly like the circular shapes on pink, a bit like a galaxy of swirling stars. 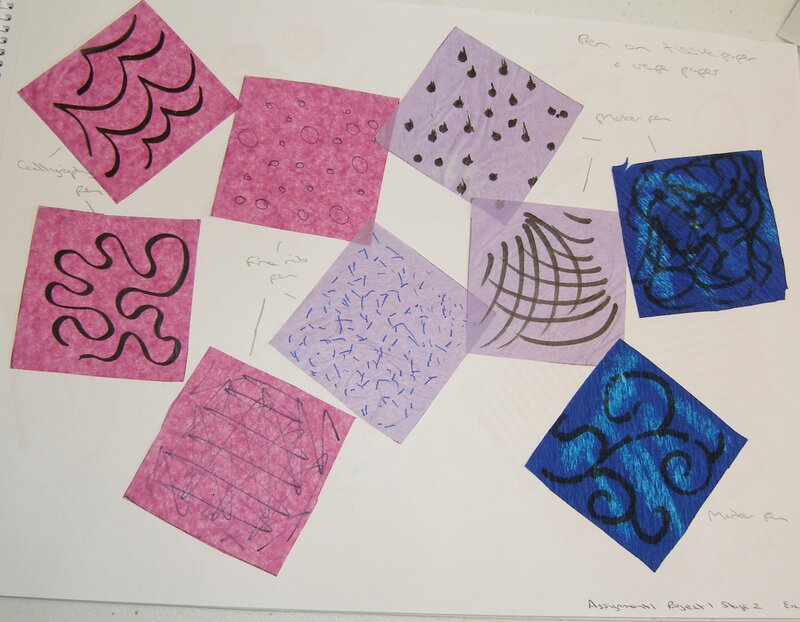 More use of tissue and crepe paper, this time using thin or thick pens and a calligraphy pen. The calligraphy pen is nice to use because the shaping of the nib automatically produces thick and thin lines which would be a feature that could be repeated in stitch rather than a line of the same thickness throughout. 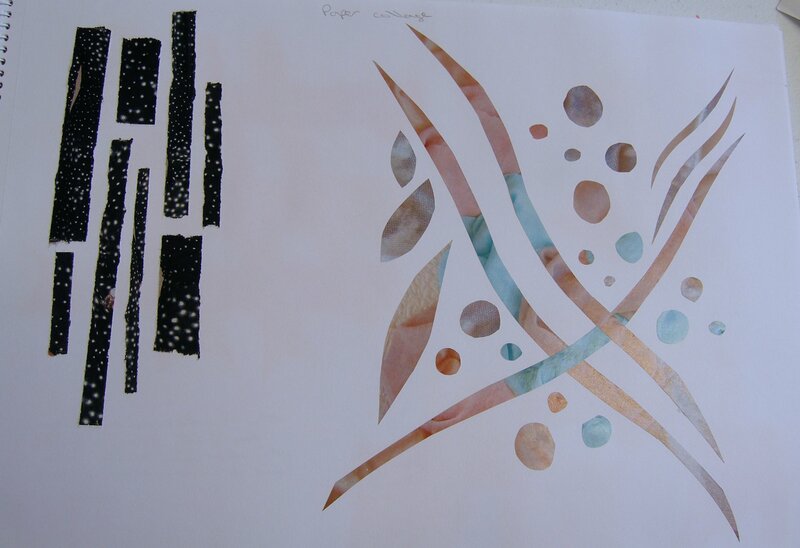 I did two pages of block printing, the first (not shown) using a bottle cork, bottle top, piece of decking board and the second using shapes I cut from polystyrene. 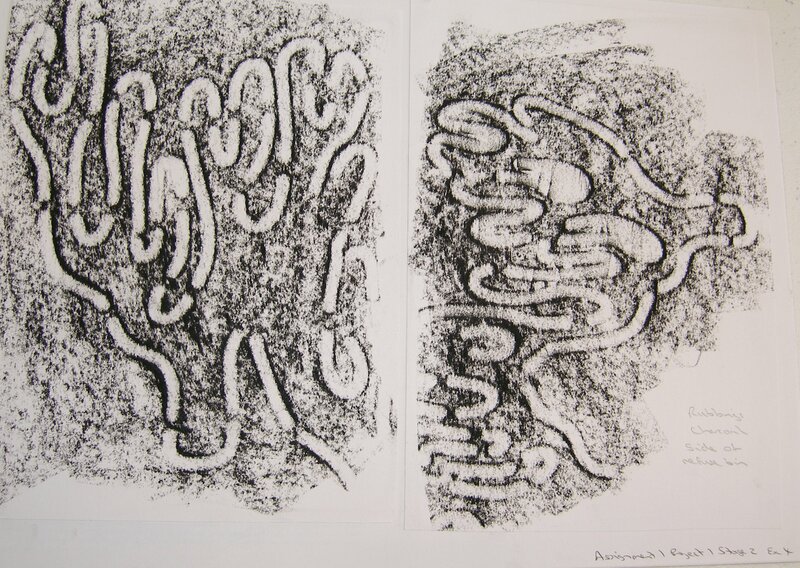 The polystyrene itself produced an interesting texture particularly when a number of prints had been done and there was less paint on the surface. The first page of collages uses torn or cut pieces from magazines. For the second I put a couple of different colours of acrylic paint onto a wet wipe and scrunched it up to spread the paint over. 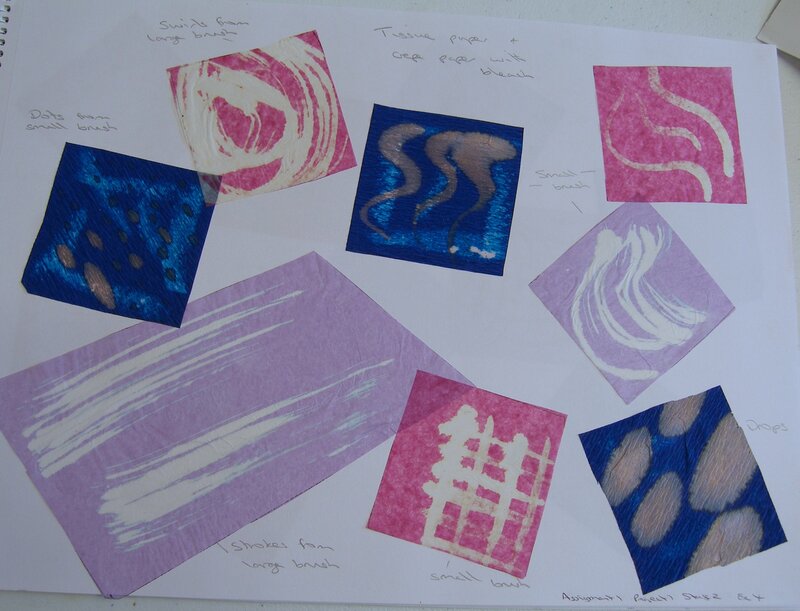 I then used a second wet wipe to wipe my hands clean, this produced a softer version in the same colours so I tore the two wipes up and collaged them. I also added a few pieces of dressmaking pattern tissue as I thought the smooth surface of this would contrast with the woven surface of the wipe. The suggested medium for combing was to use gouache but I haven’t got any (still waiting for it to arrive in the mail) so instead I used nail varnish. I then used a comb or the end of a bamboo skewer to mark through the varnish. 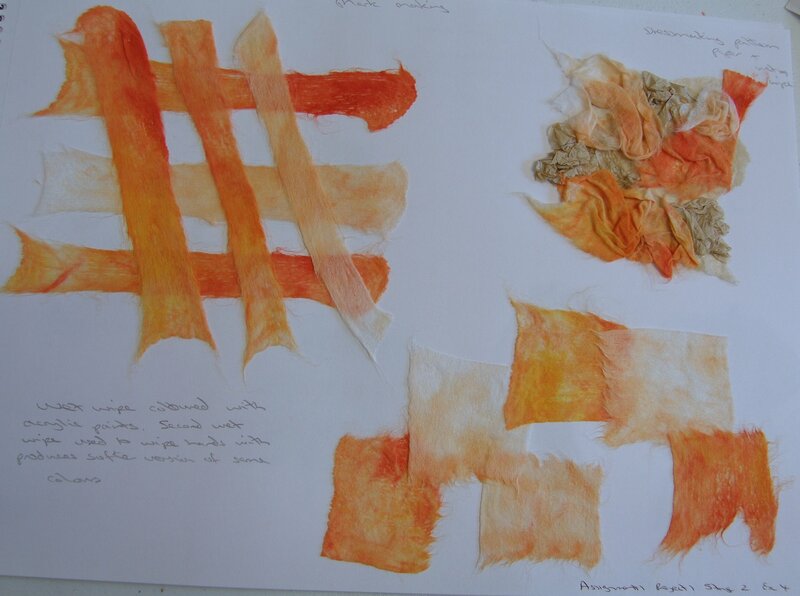 The image middle bottom of the page is striking with the darker bands of horizontal colour and then the vertical strips, a possible use would be a fabric base, torn fabric for the horizontal bands and then stitches up and down. 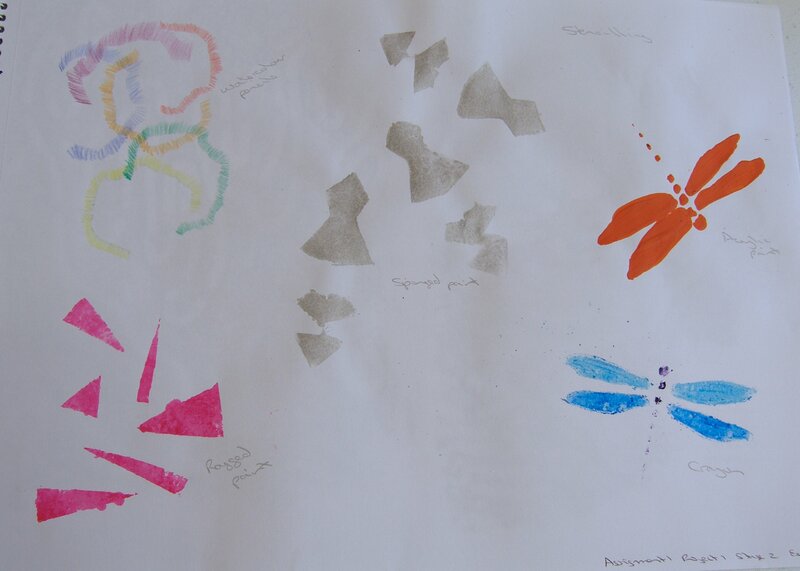 A simple dragonfly stencil cut from paper and applied with crayon and acrylic paint. Also a piece of paper folded in half and cut on the folded edge, then opened out and sponged with silver. 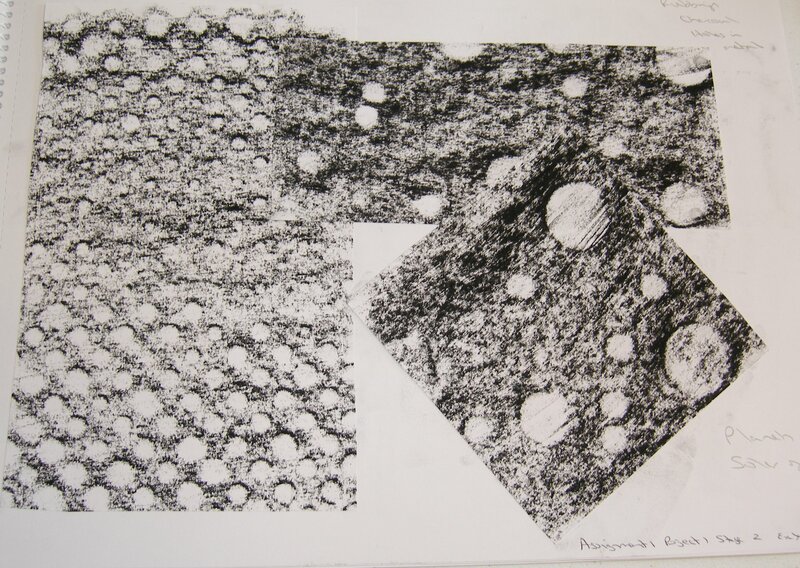 The edge of a torn piece of card was moved around and different colours of pencil applied over the edge to form an overlapping pattern. 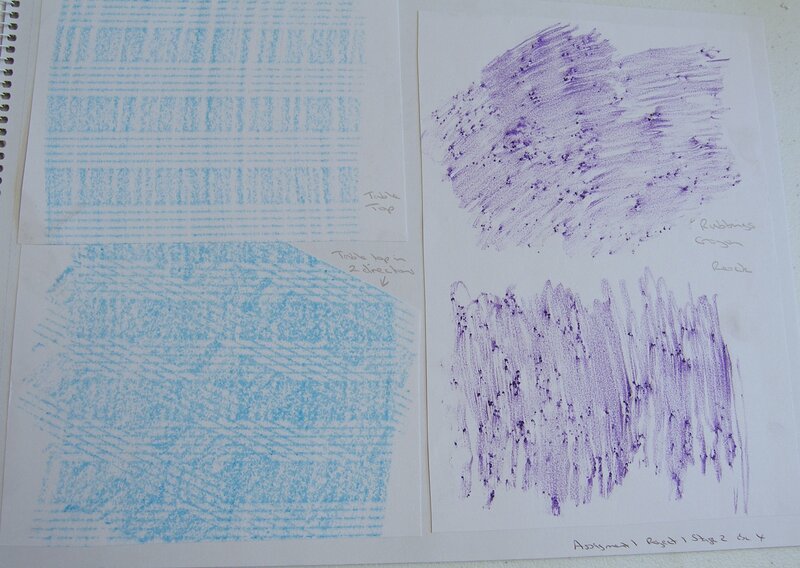 I had fun with rubbings! An early morning trip to the town park provided a nice range of surfaces to play with. I used wax crayons and charcoal but prefer the charcoal for the distinctness of the image and contrast black against white.